As many as 400 teacher of TK/PAUD serving under East Jakarta Administration participated in early childhood education seminar in East Jakarta Mayor Office. Various materials were given during seminar, such as pattern of teaching and learning.
" We want to produce qualified teacher, where they are able to keep abreast of the times and keep the noble values of the Indonesian nation"
Zita Anjani, en expert of early childhood education said, seminar was held to create teacher human resources (SDM) with the best quality, especially for TK/PAUD teacher. Hence, he also held teaching movement towards 1,000 teachers. "We want to produce qualified teacher, where they are able to keep abreast of the times and keep the noble values of the Indonesian nation," he stated, Tuesday (3/1). 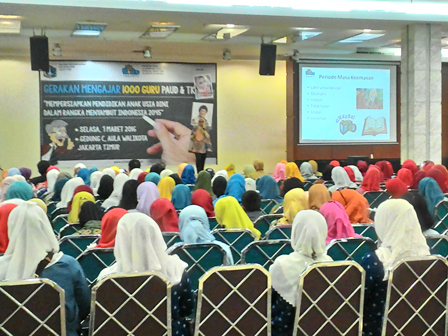 East Jakarta Secretary, Junaidi added seminar is very useful and helpful for TK/PAUD teacher. "Other agencies should also have to contribute and improve the quality of TK/PAUD teacher," he expressed.